This workshop was opened in the first years of the community to make the rich artistic heritage of the Christian East known to our friends and guests. 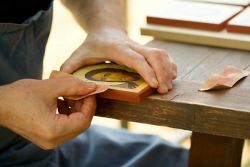 In the past it produced copies of ancient icons by pasting printed reproductions on chipboards or multilayered boards. 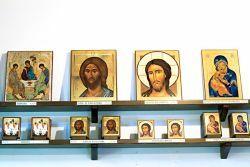 Since ten years ago our printed icons have been realized by reproducing only icons painted in our monastery atelier, and by pasting photographs on medium-density fibreboards (MDF) or solid beechwood. In order to protect them and to keep their bright colours, the printed icons are finally spray-varnished. Small-sized icons can be placed on the table by means of a provided base, while large-sized icons can be hung on the wall. 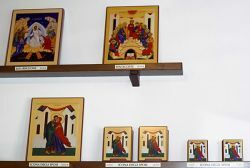 Our printed icons and wooden crosses are on display in the hall next to the reception room of the monastery.